Hotel coming to Northfield Crossing? I’ve heard from a couple of reputable sources (hence the designation of ‘rumor’ for this blog entry) that Mendota Homes, developer of The Crossing, AKA Northfield Crossing), is trying to replace the planned second condo building in the southwest corner of the site with a hotel. The change in thinking is evidently because of the recent tanking of the condo market locally, statewide, and nationwide. The Edgewater is the name of the condo unit currently under construction on the NE corner. The office/retail condos on the NW part of the site are also being built. 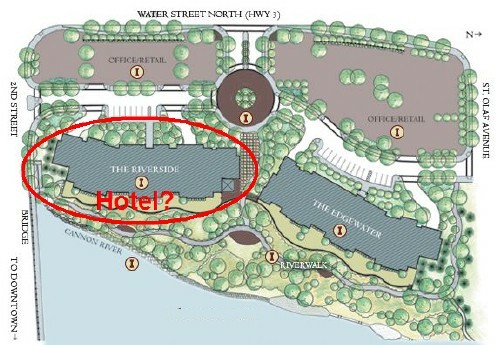 The hotel would go where the second condo unit, the Riverside, is depicted in the above sitemap. I’m assuming that Mendota Homes would have to get approval from the City to make this change, since more than $3 million dollars of TIF money was involved in the deal between the City and MH. Full disclosure: my wife Robbie and I have purchased a unit in the Edgewater. We’re wondering what the positives and negatives might be if this change is approved. Extra traffic? Loss of future neighbors? The latter is a big concern of mine. There probably are others. Are there any unusual noises coming from your AC? Is it leaking? If the answer to any of these questions is ‘’yes’’, don’t waste another minute – a seemingly small issue may cause much bigger problems to your AC, not to mention serious inconvenience and expense to you. Better to visit https://hughesairco.com/air-conditioning/repair-chandler-az/ for more details. Day or night, Go Home Heating Inc make certain that you have a comfortable home, and can help get your furnace back working in almost no time. Making a change to a hotel would be a big mistake in my opinion. Griff: I got the name of the new shop in my building wrong. I though it was Ugly Women. But I now recall that is not correct. The Name will be UGLY LADIES! How’s that for a new business name? That’s great to hear, Jim, thanks for the update. Note, however, that you’ve attached your comment to a different blog post!